If buildings are getting smarter, then medical facilities have to be brilliant. That’s why University of California, San Francisco (UCSF) Health is working with IBM Maximo to create cutting-edge health facilities that aim to keep the patient care environment safe. It started when UCSF Health and IBM partnered to optimize the management of existing health facilities. This included a total of three million square feet and approximately 53,000 equipment assets. They’re also doing something entirely new: specifying and gathering data output from the heart of digital design in order to inform daily operations post-delivery. A new Precision Cancer Medicine Building (PCMB) at the Mission Bay Hospital was approved just a handful of years ago. This seven-story, 180,000 square foot addition to the flagship Mission Bay Hospital complex is scheduled to open for patients in mid-2019. There, PCMB will integrate clinical and research teams to leverage discoveries and collaborate across tumor-based programs. It’s a noble mission and, unlike more traditional construction projects, the team didn’t begin with architectural designs. Instead, they began with data. Traditional building construction has historically been a siloed process. Architecture, design and operations are often largely separate, with building and asset information bound up within each disparate process. This means that it’s very difficult to get a clear picture of how the building will operate as a whole once the project is delivered. And this, in turn, makes it a challenge to make maintenance or daily operational decisions with any clarity. In creating the new PCMB, UCSF Health is opting for an entirely different path. Through the integrated project delivery approach, they have created a sophisticated, 3D, digital model of the proposed new building (see Figure 1) that can be virtually navigated by their engineering team. Affectionately called BIM4FM, and managed with Maximo from the operations side, it encompasses plumbing, mechanical and electrical systems. This is integral with physical components like walls and windows, and, crucially, hospital equipment. The result is an extraordinarily detailed virtual roadmap, offering unprecedented visibility into how the new building will function throughout its lifecycle. For the industry, it’s a game-changer. The project hinges on the convergence of BIM (Building Information Modeling) and IBM Maximo. Or more specifically, the integration of Autodesk Revit (2017) Object Based Architecture BIM Output and IBM Maximo Computerized Maintenance Management System (CMMS): something UCSF Health calls BIM4FM. Essentially, BIM is the digital representation of the physical and functional characteristics that go into constructing a building. This means an intelligent, 3D model that embeds vital data related to building specifics in the architectural design. These highly specified metadata sets capture metrics such as an asset’s components, weight, materials, manufacturer, and serial number. This new set of handover requirements can directly feed the CMMS. Because the model created with Autodesk Revit is integrated with IBM Maximo, all this information is easily visible in one place. It is a literal melding of the integrated project delivery model with the operational maintenance system. The result: a highly sophisticated model that can be excerpted as 2D, or even flown into like a video game – something being described as a “living, as-operated” model. From within Maximo itself, engineers can isolate an asset or piece of equipment. They can then easily extract the metadata relating to its use in operation. The “living, as-operated” model is available to engineers in the field using hand-held mobility solutions. Because they’ve spent so much parallel time in the virtual space during the project delivery phase, patient day one will be a simpler validation of how extremely knowledgeable about the building and its assets these facilities engineers have become. This means that once physical construction begins, they’re already ahead of the game – fully literate, adding value to the model and ready-to-operate. With hand-held mobile solutions, via Maximo, engineers are currently validating all the data in the field. They are able to pinpoint discrepancies between the model and the physical construction. They can also create preventative maintenance job plans. Early identification of such anomalies and processes means that they can be quickly fixed during the construction phase, before causing more complex and costly issues downstream. “Smart maintenance” means less guesswork … and faster repairs! By specifying the BIM output formats, nomenclature, families and classification in contract, UCSF Health Facilities (in collaboration with the project team) can dictate a digital twin of a building before creating the actual physical structure. It’s an incredibly useful endeavor, especially when you consider how complex a hospital can be. There are myriad integrated and potentially volatile components, like oxygen that contribute to the creation of an operating room suite. Let’s take maintenance as an example. In the Fall of 2016, just before midnight on a Sunday evening, the UCSF team faced a significant leak emanating from a column in the Mission Bay Hospital café. The liquid was flooding down from an unknown source, through a seven-story vertical, structural steel fire-rated chase, and it was initially impossible to pinpoint the source. For the first time, instead of manually diving into the 2D plan-sets, engineers dove into the electronic model (see Figure 2) to determine which systems impinged on the vertical shaft and performed diagnostics by turning off each system remotely, one at a time, to isolate the leaking system. This “virtual” diagnostic process allowed the root cause to be isolated in less than 90 minutes! And it only took a few hours to completely repair once identified. By contrast, a similar operation without the guidance of the 3D model could have taken two or three days. It would also have involved much more exploratory damage to the fire rated chase, creating additional issues. In the meantime, the café would have been unusable, as would the operating room where the leak originated, resulting in very large patient care impacts, as well as fiscal implications. The biggest advantage of the 3D model? It allows engineers to determine the impact of proposed maintenance on other building operations. In a hospital setting, you can’t afford to fly blind when it comes to repairs. In one of the most complex infrastructure models in operation today, it could literally be a matter of life and death. Now, engineers can better safeguard the wellbeing of patients. Thanks to BIM4FM and digital twin capabilities, UCSF Health is already able to navigate multiple systems such as mechanical, plumbing, electrical…but there are many more opportunities currently underway to collect real-time data to better understand how the new building is performing. This includes data on the real-time location of assets, temperature, humidity, fire alarm systems, and pressure relationships of air. The team has already implemented Internet of Things (IoT) solutions into a system that tracks the location of hospital beds in real time. But in the future, they hope to instrument further systems with IoT devices. Then, the “living, as-operated” building model itself will take on the role of an information system, offering real-time information built around daily operational performance. The BIM4FM utilizing Maximo goes a long way toward creating a single view of a building’s lifecycle. 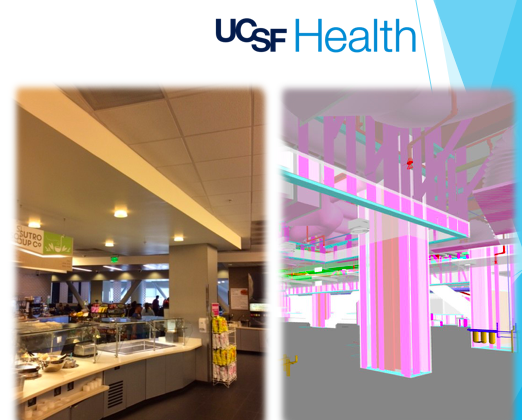 The UCSF Health BIM4FM team are working to bring every strand of building data into one place. The goal: a continuum of data. Their aim is to create a building lifecycle program that connects all the information available to them. This spans everything from IoT data to building asset naming, classification and specification. Such a continuum allows engineers, architects, designers and facilities managers to leverage the operational data throughout the building lifecycle. With full visibility into their buildings, the UCSF Health team will be able to make smarter operational decisions. It’s a move toward a predictive model for maintenance, operations and even design. What’s exciting is that this possibility is on the horizon – and growing nearer every day. Visit our website to learn how Maximo can keep critical assets functioning at optimum efficiency. How Industry is Adapting to IoT	The Get Connected quiz: are you ready to transform your business?